Before you get all excited, screaming “I thought you promised us shoddy photos while on vacation!” I should let you know that a) yes, I did promise you that, and shoddy photos you soon shall get, and b) I made these prior to leaving town. I wanted to make sure that if everything went south (like I did) you would still have some treats. Besides, we make these for vacation (I’ll be making them this evening), so I’ve saved everyone here the excruciating pain of waiting until photos are taken before they tear into these. And believe me; you don’t want to be caught in a situation where guests/family/friends see s’mores bark and are told they can’t immediately eat it. You learn quickly that people do indeed bite when provoked. Turns out that specific combination of ingredients above, all piled onto graham cracker crust, is enough to make even the most level-headed person go berzerker. It even make me go berzerker, and I never even knew I loved s’mores things until recently. As un-American as it sounds, we weren’t big s’mores eaters. To this day, the sight of a big fat marshmallow-laden cracker doesn’t cause anything even approaching hysteria in me, and I feel a little left out for that. But you give me s’mores flavors in a slightly altered package? Different story. Maybe I’ve never made s’mores correctly. To me, it’s dry graham cracker under softened chocolate (also slightly dry-tasting to me), under toasted (hi, dry) marshmallow (also somehow dry and sticky at the same time). The flavors are so totally there for me, but the overall texture – I’m sorry – leaves me wishing for a different way to do things. To give these flavors more ooomph. Right there; thaaaaat’s it. Oooey, gooey, s’moresy goodness all melted together and then chilled up for you to take wherever you go. I wish I had thought of this myself, but my favorite two guys from Baked thought of this one for me. When I made this last year, I had no idea the hit it would be. It went with me everywhere: a few parties, gifted to friends, and each vacation day was not complete until we had all sat down with a few chocolate triangles of delight perched atop vanilla ice cream. Understandably, this was item #1 to make this year on vacation. 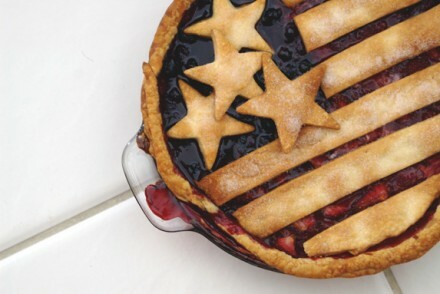 It is probably the single most awesome way to continually bestow upon people a dessert while not having to work at it. You can put this on ice cream; you can eat it by itself. Whatever. And the recipe makes a giant 9 x 13 pan of bark, so you have – I calculated this – 117 square inches of s’mores flavor. It’s the summer bark to my winter bark, which people demand I make for them the minute November rolls around. 2. Although milk powder is (obviously) dry, using it seems to make things more dense, more focused, more together. Everything works towards a common goal, and that goal – besides flavor – is amazing texture. This crust without milk powder can be crumbly. With? It almost adheres itself and becomes one with the chocolate layer. Not only is this delicious, but makes them easy to cut and even easier to transport without incident. Hopefully that helps aid you in your search for “slightly larger than normal-size nonpareils.” I have a way with words, I know. Adding to the visual aids, I’ve included the finished bark, both side and overhead views. It’s always hard to describe how I cut them, but I think triangles work very well, and that variety is key in you not losing your mind with these. Treat them like a traditional bark (like the kind you chill and then snap into pieces with your hands) only use a thin, sharp knife to mimic that look. No pressure for exactness here; in fact, I think they’re much cuter when slightly haphazard. And stay on the small size with these; they can get melty on you and are on the rich side of the food spectrum, so you won’t want cake-sized pieces. Well, scratch that; you absolutely will want cake-sized pieces, but you won’t want to make yourself ill. Small pieces, please. So, I’m off to enjoy my own piece of bark and maybe sit on a beach somewhere and stick my toes in the sand and wonder how I could write off multiple trips to tropical locations as a “business expense” for the blog. Except this blog makes no money and mostly I spend money getting food, making things, and then eating them or giving them to people. Oh well. Back to the beach. 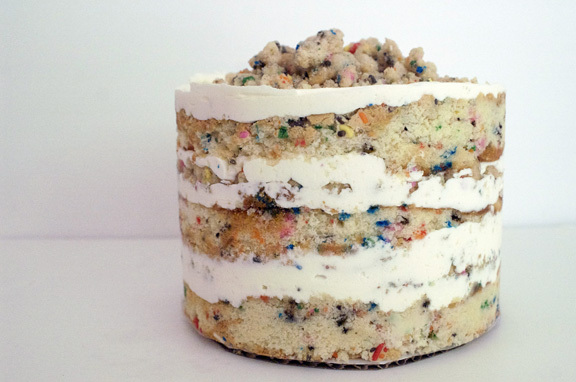 That’s not beach; that’s graham cracker/milk powder crust. Seriously, it is. This is the beach. And that’s me and the baby in a rare moment of “go ahead and snap that photo of me, it’s fine” one year ago this week. She’s old enough now to really just enjoy every single bit of everything here, which is totally fun for everyone. I’m going to get back to this wee face now. She also enjoys this bark quite a bit. Tiny kid approved. Adapted from Baked: New Frontiers in Baking by my favorite duo, Matt Lewis and Renato Poliafito. *as I said above, you can omit the milk powder if you want to, although I do think it really adds a depth to the final product. If you omit the milk powder, lower your brown sugar to 2 tablespoons and your butter to 10 tablespoons. **do not be tempted to use chocolate chips, candy bars, or any other substitute for actual baking chocolate. I use Ghirardelli because it works very well and has never given me any problems. There is nothing more depressing than throwing away a saucepan full of seized chocolate because you didn’t use the right type. Preheat the oven to 300°F. Butter the sides and bottom of a 9×13-inch glass Pyrex (or Pyrex-like) baking pan, or spray it with nonstick cooking spray. 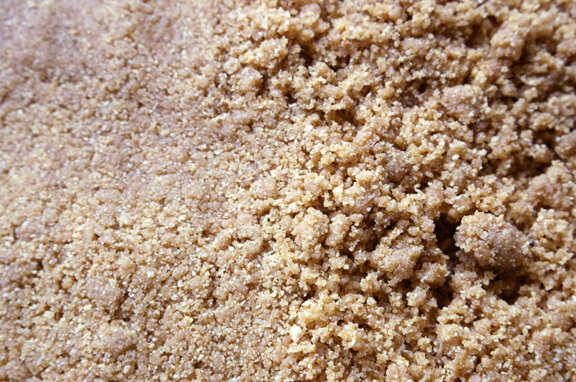 In a large bowl, stir together graham cracker crumbs, milk powder, salt, and brown sugar. Add melted butter and mix well until combined and evenly damp. Turn it out into the prepared pan and press the crust into an even layer along the bottom of the pan. Remember: you’re not going up the sides for this one as it is just a level bar. 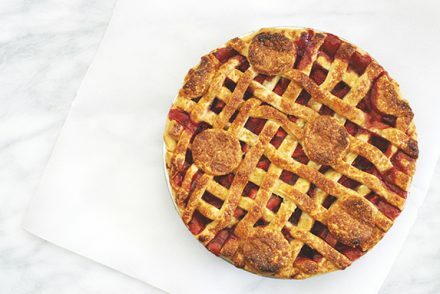 Use the bottom of a measuring cup to create a perfectly even crust. Bake the crust for 10 to 12 minutes, or until it is golden brown. Remove pan from oven and place on a cooling rack. Let cool completely before pouring in your chocolate mixture. 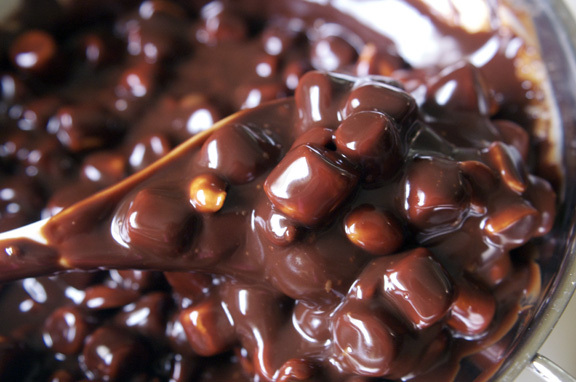 Place chopped chocolates (all types), heavy cream, and corn syrup in a large heatproof bowl or double boiler. Set over a pan of just simmering water, being sure that your heatproof bowl does not touch the water in any way. Stir frequently over low heat, slowly melting your chocolate and cream and syrup together into one cohesive mixture. Once your mixture is completely melted, remove from heat and let cool slightly for about 10 minutes. Fold in marshmallows and whole peanuts. Pour mixture over prepared crust and use an offset spatula to spread it as evenly as possible. The marshmallows will fall where they may, and some may clump up like little sugar islands; take a spoon and lift some to spaces where there are less of them in the chocolate. I like to distribute my inside stuff as evenly as I can; it’s only fair. 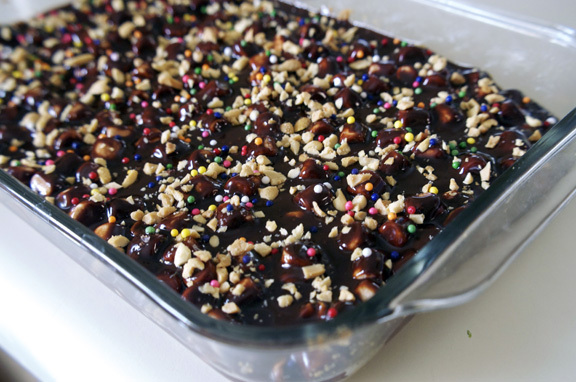 Sprinkle the top with chopped peanuts and sprinkles of your choosing. Refrigerate for at least 5 hours, or until set. Cut into haphazard triangles (it’s fun!) and serve. The bars will keep in the refrigerator, tightly covered, for up to 3 days. I love the looks of this! 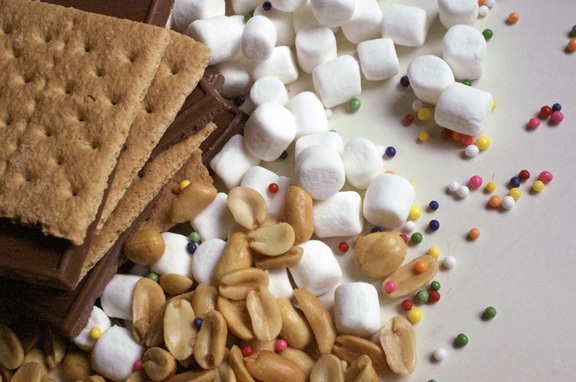 I’d probably leave out the peanuts… because peanuts do not a s’mores make. 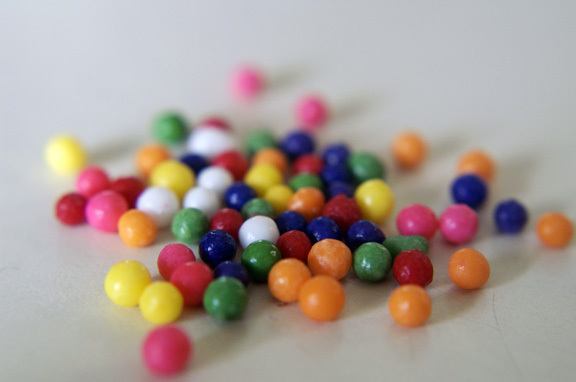 And despite your subtle hints that “well-stocked” grocery stores will have large nonpareils…. my grocery store definitely does not. Heck, they don’t have vanilla beans or saffron, why would they have these puppies? I’d love to make the crust into a sort of toffee layer. Or maybe that could be the next layer up above the crust. It all sounds so delicious. i dig your purist attitude towards s’mores, and i respect your choice to leave out the peanuts. did you like that? sometimes i really DO get spoiled a bit with what I have access to – i never realize it until i’m somewhere else, so i try to at least give fair warning. i actually couldn’t find large sprinkles down here (in my top-secret vacation location), so i opted to use the rest of the normal funfetti-type sprinkles we had leftover from the other night. the vanilla beans are totally gross at my local market. i have to make a penzey’s run for those. ditto with saffron. 🙂 so mine doesn’t have everything, but I will say the right combination pack of stores in my area can get you most anything. except for passion fruit puree. ugh! toffee would be LOVELY; my mom makes an english toffee which looks like a thinner version of this bark (minus marshmallows and peanuts, plus pecans). if you do that, i want to know how it turns out. When I vacation, no one makes me yummy things. And for this, I am really sad. 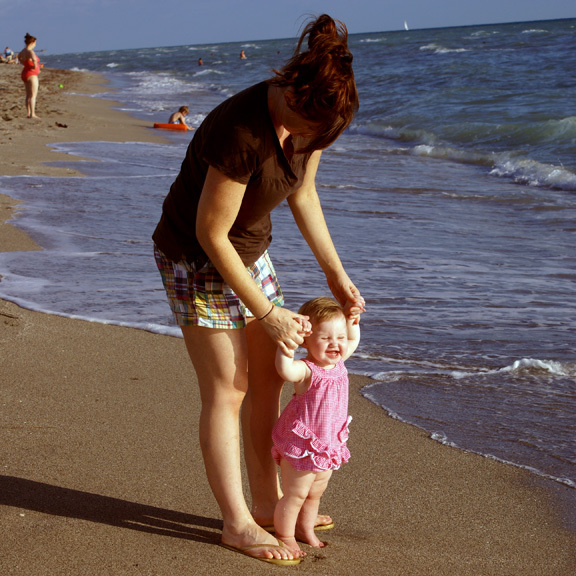 I adore that pic of you and the Wee One. There’s so much joy in that little baby face that it makes my heart melt. Also, I may need these. Now. i think that is crazy talk-if anyone deserves some yummy things thrown in their general direction, it is you. i’m already making a list of people i want to vacation with, and you are so on it. we could just make each other yummy things back and forth. there should be such thing as food blogger summer camps, where everyone meets and makes all sorts of food (everyone has kitchen detail). you could bring your family members and they could do normal crafts while we baked and cooked. 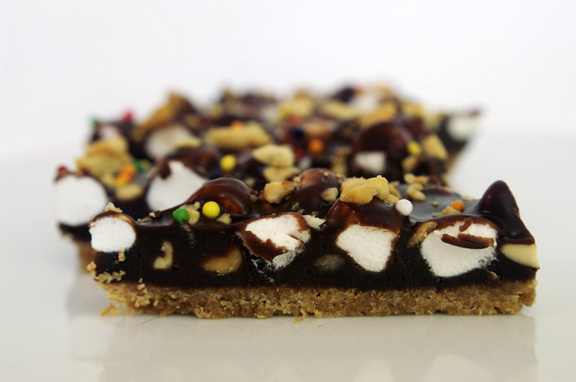 S’mores bark, summer bark, either way, I have to have some of this bark! Mallows, peanuts, and chocolate all melted into a delicious pile spread over graham- my heart just skipped a beat. Your “wee one” is just about the cutest thing I’ve ever seen. Enjoy your vacation. what a delightfully amazing idea. natalie, yes: milk powder is just powdered milk. On the Carnation brand I use, they call it “milk powder” but the two are interchangeable. i don’t know if quality varies from one to another, but if i remember correctly, my book recommends Carnation (but i will look again). and thank you! ‘delightful’ is an excellent way to describe these. we just sat a few triangles on top of our ice cream last night, and it was DIVINE. you would love these. Oh, wow. These look incredible, especially the addition of the slightly-larger-than-normal nonpareils. And your Momofuku Milk Bar inspired addition of milk powder is exciting – I have a box of milk powder hanging around my pantry (I don’t remember why it appeared in the first place), and this trend will help me use it up! thank you, ashley! i hope the larger nonpareils aren’t too hard for people to find; sometimes i find when i visit other places that i’m a little spoiled with the grocery offerings in my neighborhood. They’ve always been at my local market in the baking section, and they have a nice little crunch to them which we all enjoy. Okay, this recipe is incredible. I agree 100%, s’more flavors are wonderful, but the texture is only ‘meh’. This bark sounds perfect, though – like eating a candy bar! And such a great idea to make them for vacations. Love it! yay, Willow, you get me! i thought i was going to get blasted for that because i know it’s never safe to rip on s’mores (even though i think the world of them). maybe it’s okay because s’mores are and always have been something quick and fun and portable and not so much about the texture. it is just like eating a candy bar. in fact, i should have put that in the post. you get a little distracted with the smell of hot chocolate and marshmallows and peanuts around. 🙂 thank you! at first, when i began reading this and saw “woodwork,” i thought “oh no! movita never makes spelling errors but that’s a funny one because it’s still a word, and this is about bark…get it…” (chuckle, snort). because i’m a total dork like that. so you can imagine how delighted i was upon reading the rest and realizing you had crafted me an ENTIRE COMMENT MADE FROM WOOD AND TREE-BASED JOKES. extra points for both “beech” and “sassafras.” and also for coming back and ADDING another joke, which almost never happens and for which i feel blessed. That pic of you and the little one is adorable!! Can’t wait to see more of her from this vacation. She is darling. I bet she went berserk for that bark? I know my 2 year old would! This is an awesome recipe and one I’d love to make this summer! thanks maggie! she’s a fun little biscuit for sure; i can’t believe when i look at these photos how much she’s grown since last year at this time! and she can do and enjoy so many things more now that she’s older…the time here has been so fun with watching her love every minute. Ah! Clever Momofuku touch! I can hardly wait to try this! mary rose, thank you so much! This was so good with the momofuku inspiration, although it may be hard to really mess up something called s’mores bark, right? 🙂 it disappeared from its storage container faster than i care to admit. I love s’mores so much, but they aren’t something I get to eat very often. But your s’mores bark could be very dangerous for me! I imagine that I would also go “berzerker” over this! I seriously love you right now. Like big time. thanks, peter! these are a big hit when i make them…very fun, for adults and kids. 🙂 or rather, it turns adults into kids. farmers’ market monday: mission fig + prosciutto salad.